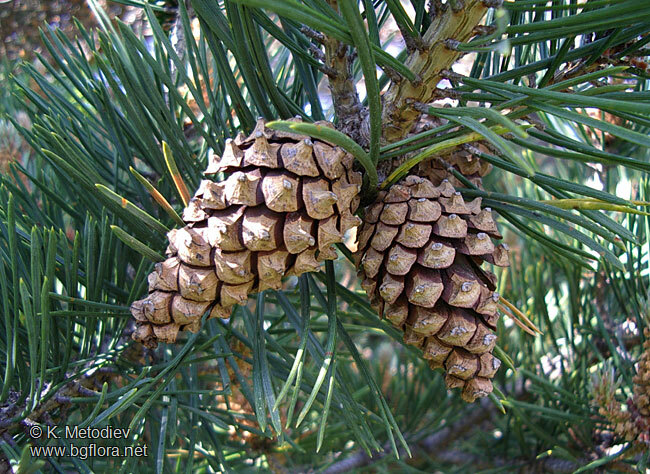 Pinus sylvestri.scotch-pine-needle-and-cones.© K.Metadiev www.bgflora.net.urbantreealliance.org (Accessed 3/2016). Pinus is a genus of evergreen gymnosperm trees, or sometimes shrubs, sap aromatic. Leaves: Needles, mostly in tight bunches of 2-5, growing on very short shoots. The needles develop from the short shoot and are surrounded at their base by one to several membranous scale-like leaves. The needles and tiny branches fall as a unit after two or more years. The tiny branches holding the needles grow from larger branches that have leaves reduced to bark-like scales. 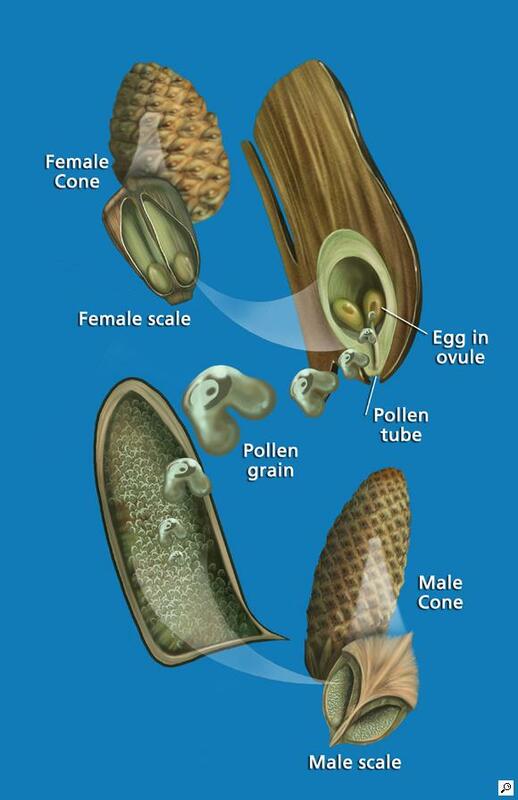 Pinus cone development.Pine cone pollen and scale. For U.S. Botanic Garden Conservatory. Images produced under contract to Design and Production, Inc. © by Karen Carr.karencarr.com (Accessed 3/2016). Flowers: None. Gymnosperms. Male cones develop in clusters at the base of the new growth. They are small, often red or purple and fall off after releasing their wind-dispersed pollen. Seeds develop in the woody female cones. These seeds grow at the base of the second or third years growth on. Two ovules develop at the base of each of the spirally arranges cone scales. These differ by species and are important in identification of the species. In general there is a spine on the upper side (umbo) of the scale. The ridge or protuberance across the scale (apophysis) is the only part showing when the cone is closed. Fruit: None. The seeds are mostly winged and dispersed by wind as cones open in dry weather. 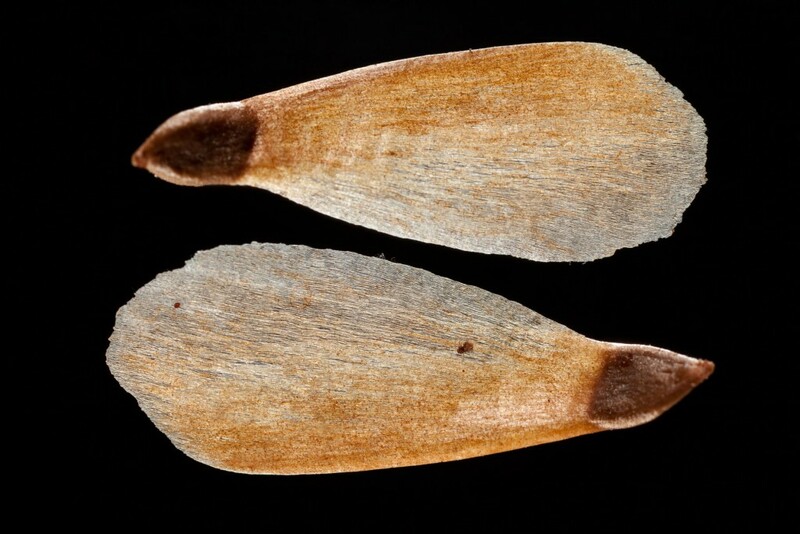 However, some cones only open in the presence of the heat caused by forest fires and these seeds germinate where they drop on the cleared ground.